1. THIS SUNDAY/TOMORROW (August 26th). The message title is, “When God Brings Justice” (Part 3), and we will see Jezebel’s grisly end. And yes, there are timely lessons for us to learn from her life and demise that are very applicable to us today. You’ll want to be there for sure. 2. Assuming that tropical storm/hurricane Isaac doesn’t cause power outages all week, NEXT SUNDAY (September 2nd) will be the final message in the current series. We’ll see Elijah taken up into heaven in a whirlwind, and why. 3. THE FOLLOWING SUNDAY (September 9th) we will be receiving communion. I always love communion services at PCC because I experience God in the sacrament. I’m never the same. 4. TODAY (Saturday) - Renae and I spent the day at the beach today. It was a much needed break from the routine. Took a bike ride. 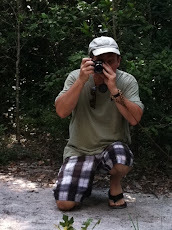 Then went to Ft. Pickens and hiked out to a secluded area on the beach (backpacks and all). Afterwards, we had lunch on the balcony at Hemmingway’s. Very nice day. 5. BLOGGING – I’ve been blogging since February of 2008 – almost five years. I have posted almost 2000 entries during that time. I average about 200 visits/hits a day, including visits from foreign countries. Just so you know, I don’t anticipate slowing down any time soon. I’m feeling the urge to keep writing. My blog will continue to include personal stuff, information about the church I pastor, and, most importantly, matters of discipleship. 6. NEW CHAPTER – I’m looking forward to the next chapter of my life. I’m looking forward to the next chapter of PCC too. Both are imminent.